Note: Before opting for any of these, always talk to your doctor or health care provider first. Let’s start with the most boring one. 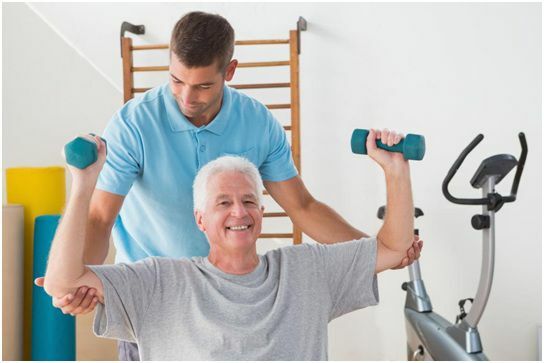 Gym might not be for everybody because many seniors get intimidated by the fast paced activities and machines inside and the loud music blasting the speakers can get very annoying as well. However, if you can get a good trainer who will create and tailor a work out plan specifically for you, then all the better. You can ask the gym to lower the music if you have any hearing sensitivity, they will always comply. You should always tell your trainer any special needs or health issues you have so that your work out doesn’t become counterproductive. If you are a heart patient then always walk at a slow pace on the treadmill and don’t lift any weights. Swimming is so much fun and one can do it for hours. Swimming is perfect for overweight seniors who want lose some inches without breaking out into a sweat and being exhausted at the gym. It’s a more fun alternative to the gym and tones the body a lot. Swimming is a full body work out as it targets the arms, legs, abdomen and torso and effectively strengthens the body. Yoga is an ancient tradition that has changed the exercise world. It is slow paced but very effective. Many seniors who have taken up yoga have reported that most of their joint problems have been relieved by doing yoga. There are special senior yoga classes as well so you don’t have to worry about doing any dangerous or awkward yoga positions that can harm your body. Ditch the boring aerobics class and have some fun by signing up for a dance class. Time just flies when you are dancing and it releases feel good chemicals in the brain as well. The easiest exercise you can get is a good walk. Make it brisk if possible and be regular. The best walks are done in a park or garden where you can be connected to nature, get some sun, and also socialize with others. Grab a friend and go for a morning or evening walk.